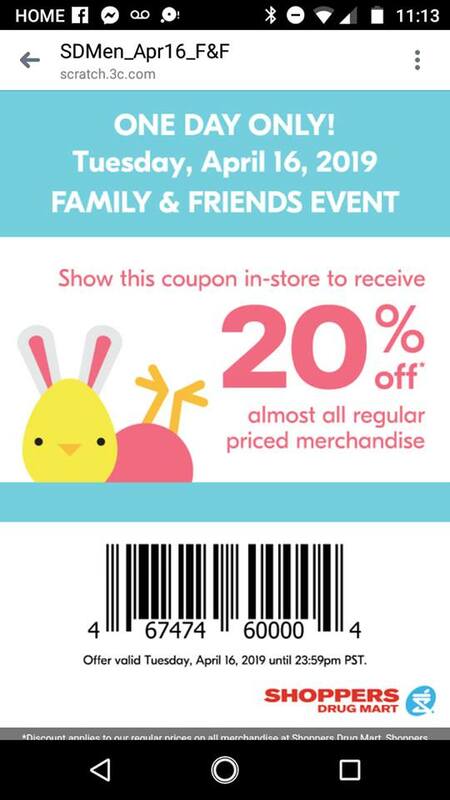 Tuesday, April the 16th only, get 20% off most regular priced items at Shoppers Drug Mart Canada during the Friends And Family event. There are usual exclusions like gift card, lottery, etc., but it does include all general merchandise not currently on sale. This offer is good if you just need to pick up a couple of items from Shoppers Drug Mart that don’t happen to be on sale, and perhaps you can’t get them elsewhere. or even if there are some costly items that you purchase from Shoppers that don’t often go on sale, but you happen to need. This offer was sent out via text, so those of you who are signed up to receive texts have likely received it. If you have not received, you can just use a screenshot of the text, which is included in this post. Just scan the barcode at the end of your purchase.